A baby female pygmy hippopotamus, making her first public appearance on Monday, 29-September-2014. You can see her in the video bellow, from Thailand broadcaster MCOT, sticking close to her mother, Jona, at the Khao Kheow Open Zoo in Chon Buri, on the Gulf of Thailand near Bangkok. 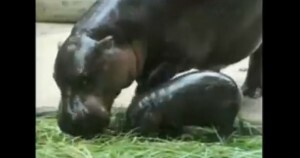 MCOT says the young hippo was born 02nd September 2014, and is in good health, the fourth pygmy hippo to have been born at the zoo, and zoo staff says she’ll have plenty of attentions next month, when schools are out for a break. Pygmy hippos are actually native to West Africa, mostly in Sierra Leone, Guinea, Côte d’Ivoire, and Liberia. In the wild, they are listed as an endangered species by the International Union for the Conservation of Nature, which places the species on its Red List. The IUCN says there were around 3,000 estimates still remaining in the wild in the early 1990s.